It really is quick and easy (although it took me a little longer than 8 minutes). 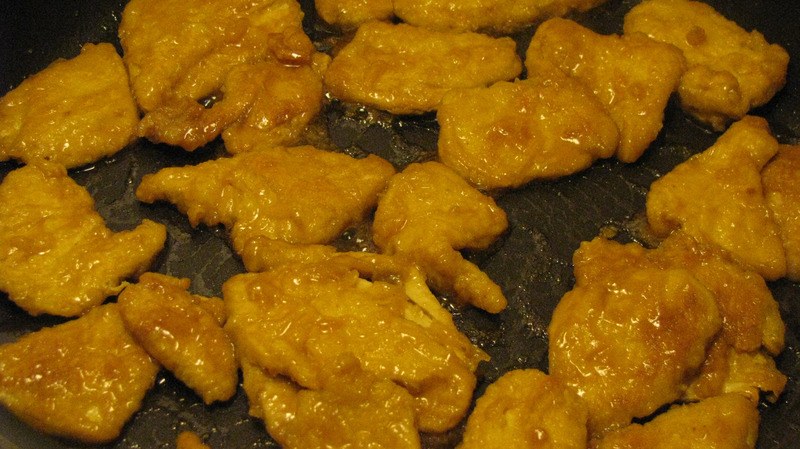 You simply heat some oil in a pan, add the chick’n pieces, and heat until brown and crispy on both sides. 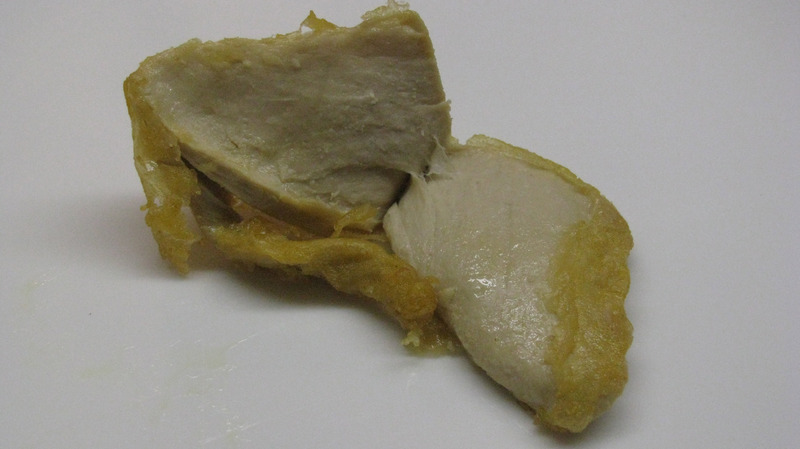 I must say, the chick’n pieces really did look amazingly like chicken. In fact, the chick’n looked a bit too much like chicken for my taste! Ok, that would be a big plus for some people, but the texture was so close to dark meat chicken it made me feel a little ill.
Next, the sauce. The directions said to thaw in a bowl of hot water for four minutes, but I just left it on my countertop and by the time the chick’n pieces got nicely browned (about 10 minutes) the sauce was thawed. 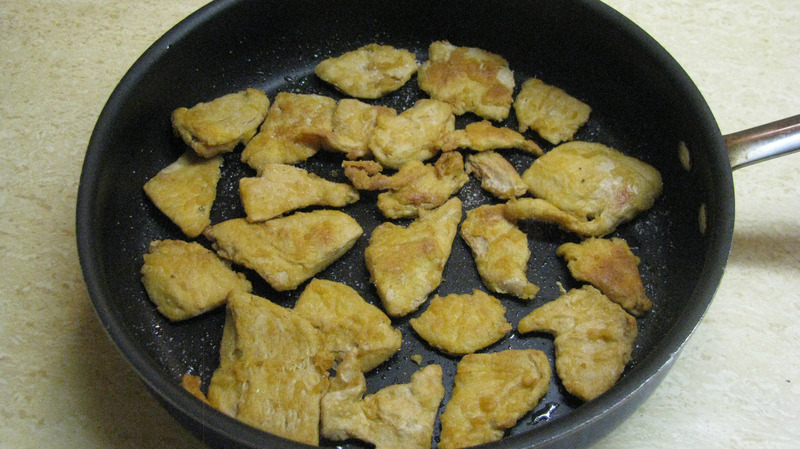 Here’s the other problem I had with this entree … there was barely enough sauce to (lightly) coat each chick’n piece! I did like the flavor of the sauce, but if there had been just … oh, a tablespoon or two more … the dish would have been improved immensely, especially when served over rice. A touch more mandarin orange sauce would have been nice. If I made this again (which I probably won’t, because the dark meat texture freaked me out a bit), I would add some mandarin orange sections, to make it a little more moist and juicy. Also to make it seem a little less like a frozen dinner. 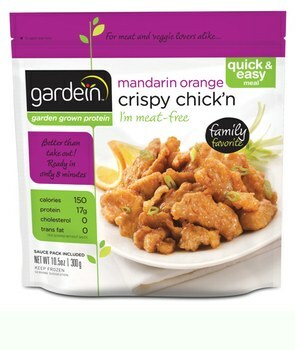 And I know mandarin orange chicken isn’t usually mixed with vegetables, but with a little more sauce a few pea pods or broccoli florets could be added, which would also make it seem like more of a meal. Bottom line: I probably won’t be buying this again, but if you don’t mind a realistic dark meat chicken texture and have a small can of mandarin orange slices on hand, you may want to try it. I just had it tonight and boy was it hard to stop eating! I loved everything about it. I’m glad! It was a bit too realistic for me but I did like the sauce! !